In its first year, Colony KC (312 Armour Road, North Kansas City, Missouri) hasn’t just pushed the envelope. They’ve stuffed it full of Lucky Charms and black currants and raspberry sherbet. As the nanobrewery inside of a coffeehouse and taproom attached to a performance space (The Rino) nears its first anniversary, Flatland sat down with head brewer Rodney Beagle to learn about the past year and what’s next for North Kansas City. Beagle set an ambitious goal of launching a new beer each week at Colony. That pursuit — Beagle has indeed rolled out a new beer a week for the past 10 months — has led to lemonade and tea ales (two halves of an alcoholic Arnold Palmer), a salted caramel porter and a winter Saison inspired by Chewbacca. “Being in a town with four other breweries, we had to do something different,” Beagle said. For the birthday celebration on Saturday, Sept. 8, there’s a trio of beers in the works. Beagle is making an imperial passion fruit wheat with 44 pounds of passion fruit in a 70-gallon batch. The wheat brew will be joined by a pair of barrel-aged beers. A brown sugar rye barrel-aged honey biscuit ale (roughly 10% ABV) made with biscuit and honey malts and lactose, and a Samsquanch dark plum sour with vanilla bean have been aged in Union Horse whiskey barrels. “It’s drinking a lot like wine, there’s flavor from every direction,” Beagle said of the barrel-aged sour. After the anniversary, Beagle intends to step back and look at Colony’s process. He expects he’ll back off the pace of a weekly release, but wants to continue to surprise people by what’s possible with beer. Belgian beers and a picnic get mashed-up in Grain to Glass’s Picnique Belgique Festival at 4 p.m. Saturday, Sept. 8. The outdoor event will be in the lot next to Grain to Glass (1611 Swift Ave., North Kansas City, Missouri) with Belgian beers from home and pro brewers, fries, a waffle from The Waffler truck and fruit pie. Brewer Peter Bouckaert, a native of Belgium and the former New Belgium Brewing Co. brewmaster, will be on hand to speak about his new book and brewery. Tickets are $40 ($47.50 at the door). Flying Saucer Draught Emporium hosts the 10th annual KC Beer Fest from 3 to 6 p.m. on Saturday, Sept. 15 in the Power & Light District. The beer festival will have more than 200 beers, food for sale (Pie Hole’s Australian meat pies), and live music. Tickets are $40. VIP tickets, which include admission at 2 p.m., are $65. Discover potential breweries of the future at the fifth annual High Plains Brewhoff thrown by Brew Lab (7925 Marty St., Overland Park, Kansas) from 2 to 6 p.m. Saturday, Sept. 15. The celebration of homebrewers will feature food and live music, in addition to the more than 100 beers available for sampling. Tickets are $30. Tallgrass Brewing Company out of Manhattan, Kansas, suspended production last Friday. The craft brewery, launched by Jeff Gill in 2006, had been looking for investors following a major expansion in 2015. Gill told The Manhattan Mercury earlier this month that “there’s about two to three months of product left,” but he’s gotten back involved with the company after stepping away from day-to-day operations. Gill is hoping to help secure a deal in the coming month. The Tallgrass Taphouse, which is a separate business, will continue to operate in Manhattan. 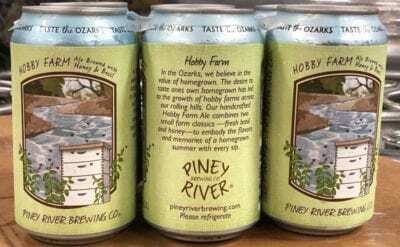 Piney River Brewing Co.’s Hobby Farm Ale should start popping up around town in cans. It’s an ale made with fresh basil and honey. Novel (1927 McGee St.) hosts a Boulevard Sour Beer Dinner ($55) with seatings between 5 and 9:15 p.m. The five-course dinner highlights five sour beers (along with a welcome cocktail) with pairings like coconut lemongrass curry with Tequila Barrel Lime Gose and Sweet Cherry Pie with a rare barrel-aged sour ale. Cinder Block Brewery (110 E. 18th Ave., North Kansas City, Missouri) is bringing back Lusus Naturae. The release party starts at 4 p.m. for the peach farmhouse sour that’s barrel-aged in chardonnay barrels for the better part of a year. Crane Brewing Co. (6515 Railroad St., Raytown, Missouri) releases its Nitro Dry Stout at 4 p.m. The Lawrence Beer Co. (826 Pennsylvania St., Lawrence, Kansas) celebrates its first anniversary with a street party from 5 to 11 p.m. To coincide with the party, LBC will release its collaboration brews with Half Acre Beer Company. The ska band Save Ferris will headline the live acts. Tickets range from $10 for general admission to $60 for VIP (all you can drink and swag). East Forty Brewing (1201 W. Main St., Blue Springs, Missouri) releases its Jackson County Common — a “golden-colored, malt forward, but balanced, easy-drinking lager.” It features Mt. hood and Loral hops. Kansas City Irish Fest runs Friday through Sunday. There’s plenty of live music, whiskey tastings and whiskey flights, and even a Sunday brunch (11 a.m. to 1 p.m.) with a Bloody Mary bar, Irish Coffee bar, open beer bar, and a menu from chef Shaun Brady of Brady’s Public House. The Beer Olympics are in Martini Corner from 2 to 6 p.m. The benefit for Street Medicine Kansas City will have teams competing in everything from Skee ball to trivia to a water balloon toss at Sol Cantina, Brick House and Ollie’s Local. Update: This post was updated because the ticket price to the Picnique Belgique Festival dropped, and a spelling error has been corrected.